Today, two days before the end of the month, I received the latest edition (October 2013) of the Timberwood Park Owners Association newsletter in my mailbox. That’s right, I said the October edition. Really? Reading it took mere minutes as most of the contents are canned articles provided by Neighborhood News, our publisher, as fillers for the lack of local community news provided by our board whose job it is to fill the pages in accordance with the advertising bought for each issue. Some of the information provided, whether canned filler article or board sponsored original article, is inaccurate and/or not applicable to our development. To point, our development was non-annexed from the City of San Antonio a few years back for a period of 20+ years into the future allowing it to be free of city taxes and city regulations with the exception of city building codes which was an agreed to part of the negotiation. So, if you read the article about City of San Antonio Animal Control ordinances, it is erroneous. We fall under Bexar County Animal Control guidelines. You will not find a City Animal Control vehicle in our development to enforce any of the guidelines published in this issue of the newsletter because they can’t. We are not part of the City of San Antonio. The last page of this issue of the newsletter even references Bexar County Animal Control under Important Numbers, not sure the number is correct however. For correct information take a look at http://www.sanantonio.gov/animalcare/. A quote from that web page states: “Important Changes to Animal-Related Services for Bexar County Residents. Effective October 1st, 2013, the City of San Antonio’s Animal Care Services Department will no longer be providing animal control for unincorporated areas of the county. Instead, all stray pickup, bite investigations as well as pet related nuisance complaints will be handled by the Bexar County Public Works department.” Read more about the press release on the web page listed above. If you called the City of San Antonio in the past you were typically rerouted to Bexar County as a member of unincorporated Bexar County even prior to this official announcement ending any courtesy services. Likewise, Timberwood Park is an unincorporated Bexar County subdivision with no sidewalks or curbs as a result. We have bar ditches which the county maintains on our behalf because they flank the public roadways of our development. Yet there’s an article about maintaining sidewalks and curbs citing city ordinances? This publication used to be valued by property owners as a means to learn about approvals by the architectural committee for improvements in our neighborhood, reports from various committees supporting our neighborhood, a current report on the board and what it is accomplishing on behalf of property owners, and of course upcoming neighborhood activities (not activities which have already occurred). Now, it appears it has succumbed to political advertisements reflective of the “boards’ ” view about how an individual should vote on a given issue, but apparently only one issue. Is that appropriate? Shouldn’t the entire ballot appear in the newsletter if political issues are being discussed? For that matter, shouldn’t both sides of a given political issue appear in a factually stated manner so that the voter an make his or her own decision? Is it the HOA board’s job to provide political opinions? The HOA board is a governing body for our developments’ expenditures and daily neighborhood business activities on behalf of the property owners, not political positions/personal opinions regarding public elections and voting. On the other hand, missing from this issue was any descriptive information about those property owners who decided to volunteer their time and talent to their neighborhood and agree to run for office in December when annual elections are held. Since the applications were due to Spectrum by September 30, and we did not receive an October newsletter issue until the end of October, where are they? We have several candidates who have decided to run for office, yet none of them are featured in our newsletter to give us an opportunity to learn about these new candidates or their interest in serving our community, much less give them an opportunity to be known by the property owners for an ample period of time prior to elections? There was not even a clarification regarding which incumbents are running for office again or whose positions are up for election this year at our annual meeting. But there was a board vote earlier this year to drop the number of elected board members from 9 to 7. Since there is no meeting now prior to December, how will we learn about the new candidates who are seeking a chance to serve on the board? The newsletter for November may or may not make it to our mailboxes before the election. For some, while no doubt a minority in our development, the newsletter is the only manner they receive information about our neighborhood. Following current trends, we would not receive the November issue until the end of November. It’s likely your mail in absentee ballots will arrive prior to that issue of the newsletter! Wouldn’t you like to know more about the candidates, like how many are running, a little about each of them and an opportunity to get to know them a little better before you cast your vote? Sadly, our development has experienced backwards growth in the communication and democratic day to day operation of our neighborhood. There has been a grand effort to “enhance and improve” our 30 acre park since we achieved turnover and self-rule, some of it long overdue and acknowledged as needing to be done without a doubt. However, it’s extremely easy to make these improvements once the dollars to do so belong to us to spend. There’s more to a neighborhood and a development than spending the assessment dollars. Property owners should want more. In this issue of the newsletter there also appears a notice which states if you wish to self-nominate you must do so in October. Huh? Where did that come from? Didn’t we receive notices from Spectrum stating a candidate profile had to be turned in no later than September 30 in order to run for office? What happened to nominations from the floor should another candidate wish to run? That appeared in our by-laws at one time to allow someone an opportunity to run for office should he or she have decided late in the electoral process to throw their hats in the ring. Much like our official ballots for state and local public elections allow for a write in candidate. This is your home, your neighborhood, your dollars being spent. There was a lot of neighborhood participation during the turnover process and staking an interest in how it was resolved. Ask for better representation. Ask for a timely newsletter to be in your mailboxes at the beginning of each month so that the news is at least something you might be able to put to use rather than an after-thought. Ask for the candidates information, so that you have some idea of the candidates actually running for office. You deserve better. Ask for it. Insist on it. I recently discovered that this blog had somehow been “disconnected” from the web page. While I have repaired the problem, apparently for a period of time no one was able to view the posts to the blog if they were not subscribers who get the updates automatically. My apologies for any inconvenience this may have caused those of you who occasionally just check the website for updates. Remember that corner lot and building on Timberline and Borgfeld the HOA used to use as an office while we negotiated turnover? It was also discussed as a potential office once turnover was completed. At meetings as we progressed and as a part of the turnover package negotiated, discussions included keeping it as an asset for the HOA in order to protect one of the entrances to Timberwood Park from unwanted development. It was also thought to be a good location for an on-site office for neighborhood business to take place for our property owners. TDC had agreed to sell the HOA the building and lot for $100,000 which at the time was thought to be a very reasonable price in order to protect the entrance from unwanted development and for it’s long-term use as a local office for property owner business to take place from. The HOA board that took over in 2011 after the signed turnover deal was completed, decided it was not in our best interest to proceed with that purchase, citing the transaction value as the biggest reason for not pursuing the completion of the purchase. It turned down the offer, subsequently vacating the premises. This past month the building and lot sold to a private entity. I do not know the purchase price but I can assure you it was market value…not the offer the neighborhood had on the table. Remember, the lots on each corner of every entrance into Timberwood are not part of the deed restrictions platted for our development. They were excluded and have no restrictions on them as to what can be constructed or operated on these sites. County restrictions are very minimal for lot and/or zoning requirements without specific deed restrictions from a development in place. Therefore a commercial activity of almost any type can take place on this lot. Elections are coming up for the HOA board this December. It is important as always for you to vote for members of our community whom you believe will represent you well. Please be sure to look at all the candidates and cast your vote for the board you would like to see lead our neighborhood and how our assessment dollars are spent on behalf of property owners for the coming year. There are 4 spots available for election. There are 7 spots total on the board going forward after a board vote changed the board total from 9 elected members to 7. Please be sure to cast your vote for the December election. The lake sealing project continues to be worked with potential revisions upward to the costs as the pumping of the existing water continues to change. With recent rains, the lake is of course filling once again. The current progress is not clear on the re-sealing project, but it would certainly be impacted by recent rains and continuing rains this week. The original project was budgeted at $280,000. It is unclear whether the potential extra costs from additional pumping now necessary were part of the original estimate or if this has now brought the cost to a higher dollar amount. Early voting will begin October 21 through November 1. Timberwood Elementary is one of the early voting sites available for you to cast your vote regarding this and other measures on the ballot in the November election. From the official Comal ISD web site Click on the following link http://www.comalisd.org/Bond_information/Bond_2013/Default.asp which provides information about the bond project. The above information was provided by member of the long-range planning committee for Comal ISD. Again, this information is provided to give you differing perspectives regarding the upcoming bond election vote. Many residents in our neighborhood with children in the Comal ISD system probably feel it would be a good addition to have a high school and middle school at this end of Comal ISD for our neighborhood students and to provide closer proximity to our homes for our children’s education without such long bus rides to their current schools. Please be sure to look at all information and note the specifics of the bond measure. Does it include monies earmarked specifically for those new schools proposed that would directly benefit Timberwood school students and Southern Comal ISD residents? Does it include specifics for where dollars will be allocated in this bond? As an informed voter it is important for each of us to cast a vote according to the information provided both pro and con. Don’t forget to vote!! With the uncertain weather in our area this week, suggest you double check to see if this week’s proposed concert will continue to be held. There may be a cancelation due to weather. 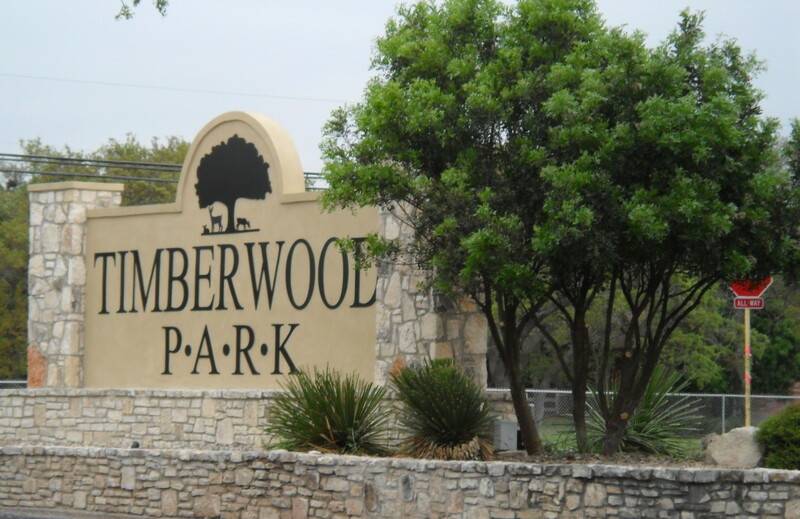 Check the “Local News” tab on www.timberwoodparksa.org for details on other activities in our neighborhood. The calendar has most current events posted.